Despite being in the twilight of his career, Speeding Spur’s future possibilities have been left wide open. 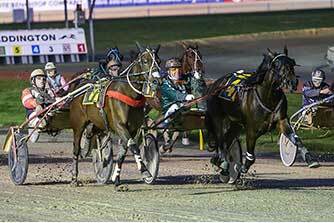 The grand trotter willed his way back in to group 1 winning form with a determined effort to take out the New Zealand Trotting Championship at Addington on Friday. The race was widely expected to be the John and Josh Dickie trained squaregaiter’s Addington swansong and his third-last start. However, Speeding Spur’s future plans will not be cemented until an upcoming meeting of his shareholders is held. That leaves the possibility open that the Pegasus Spur entire could go around on the Australasian open class circuit again next season. Speeding Spur could also be sent overseas, possibly to North America, for a campaign there. Though there has been speculation that that is an option his owners are looking in to, they would not confirm anything until after the group meets in the coming weeks. Before that theory emerged as a possibility, Speeding Spur was expected to retire after next month’s Rowe Cup, ahead of him commencing his stud career. That also remains a possibility for the trotter’s owners.